To the beat of a drum on set shrouded in fog and with costumes unlike anything you’ve seen before, Kodo wows audiences all around the world. Since their debut at the Berlin Festival in 1981, Kodo has performed over 4,000 times in 46 different countries, according to the group’s website. “Exploring the limitless possibilities of the traditional Japanese drum, the taiko, Kodo is forging new directions for a vibrant living art-form,” the website states, and the group has recently taken on a new direction with some young members and new director. “The town I grew up in was rural and it always had activities to help cheer up the town including making drum teams with local kids,” Yuta Sumiyoshi, 23, a member of Kodo, said in an interview with Nikkei Voice. “I got a flyer in elementary school and joined without a second thought,” he said. Sumiyoshi played all through school and in high school began to branch out into other instruments. He bought a flute and a guitar, and formed an acoustic duo with his friend. It was different from taiko, but it opened his eyes to the world of music. “I felt that, in essence, it was the same in terms of developing melody and rhythm,” he said, but nearing to the end of high school he took his taiko playing to the next level. Sumiyoshi entered into the Kodo Apprentice Centre in 2010. He was a tall, but very lean young man, and he soon learned he’d have to practice hard and a get a lot stronger to make in Kodo. 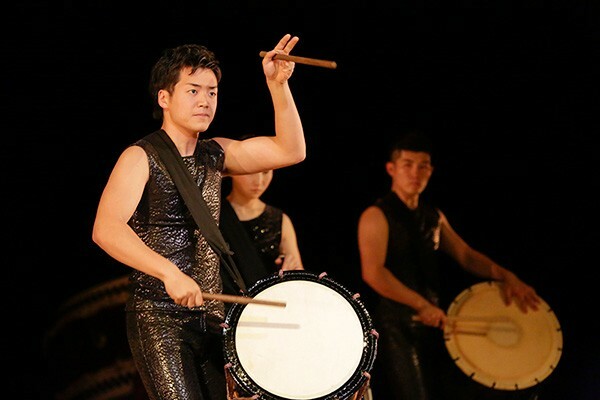 A few years later, he made his stage debut in 2012 and is a full-fledged member of the group and the O-daiko, one of the most important roles a Kodo member can take on. Although, he is a newcomers to the group, he’s also taken on creative challenges too. The upcoming tour also has four songs he composed. And under the watchful guidance of Tamasaburo Bando, the artistic director of the group, Kodo is hoping to bring their performances to even higher levels for this upcoming tour to Canada. Bando was born in 1950 and started performing when he was just 6-years-old as part of a rehabilitation process for infantile paralysis. A career as a Kabuki actor and as an onnagata, or an actor who specializes in female roles, has given Bando national recognition for his work. Bando is one of Japan’s living national treasures and was awarded a Medal with Purple Ribbon in 2014. He has been Kodo’s artistic director since 2013 and bring a pulse-pounding theatricality to the group. He even performed alongside the taiko drummers in 2006 as part of the group’s 25th anniversary celebrations. Kodo will be performing Mar. 12 at Sony Centre For The Performing Arts.